Call today to arrange your no cost in-home demonstration of our replacement windows with one of our window replacement experts. 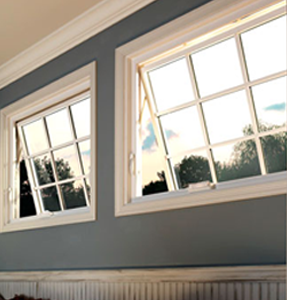 Vinyl windows are the preferred materials that modern windows are constructed of. Developed in the 1960’s for their maintenance free appeal, they have become the largest growing segment of the window industry for decades.Vinyl windows are known for their virtually maintenance free aspects and for eliminating the need of painting and rotted wood replacement. Today’s window technology has evolved tremendously and vinyl windows are at the leading edge of design and energy efficient options. Vinyl windows can be equipped with many energy efficient glass options like double or triple insulated glass, high performance Low E coatings, gas filled airspace and are certified by independent organizations like the NFRC for thermal, structural and air infiltration performances. At U.S. Windows & Exteriors, we proudly offer high quality vinyl replacement windows in the most popular styles found on the illustration below in many colors and energy efficient glass options for all tastes and budgets. We also professionally install our windows to the highest industry standards. Call U.S. Windows & Exteriors today, 770-217-1229, or submit the estimate request form to the right for your no obligation, in-home estimate with one of our vinyl replacement window experts.